Illinois Yorkie Rescue View other Yorkies for adoption. Oliver is a Yorkie mix who is 11-years-old and weighs 20 pounds. He is residing in Beach Park, IL. Hi I'm Oliver, I'm a Yorkie mix. I'm larger than the regular Yorkie, I'm about 20 pounds which is probably a little heavier than I should be but I love to eat. Sometimes I walk on the pups as I am blind and can't see where I'm stepping. They get upset with me so Mom thinks it would be a good idea if I went to a home where I'm the only dog. I have a very keen sense of hearing and smell. I follow mom around all over the house and manage the stairs without much difficulty. It takes me a little while because I have to feel where the steps are. I know when I run out of the carpet runner I'm at the top of the stairs and mom keeps a big fluffy doggie bed beside her nightstand that I love to sleep on. I can always find it! I go down the stairs okay too. I have to feel for the steps and I know when I run out of the carpet runner and the touch the wood floor, I'm at the bottom of the stairs. I'm actually a very smart little guy! I love to be with my people and would make a wonderful companion for someone who is home a lot and able to let me cuddle with them on the sofa. Mom thinks I probably wouldn't be a good choice for a home with small children as when I get startled, I sometimes snap and small children would not understand my being blind and sudden moves or touches might startle me. I have a collapsed trachea but my coughing is much better than it was. If I drink too much water, I start coughing so mom has to tell me, 'Enough, Oliver!' I can always go back for more later though. I'm pretty aggressive around my food so mom feeds me away from everyone else. I love walks but sometimes it's hard because of being blind and if I smell other dogs, I get all excited and start coughing and try to rip up the grass. Mom usually takes me where there aren't any other dogs. When I go to the vet, she keeps me on the short leash and tells all the other pups that I'm blind so please stay away. 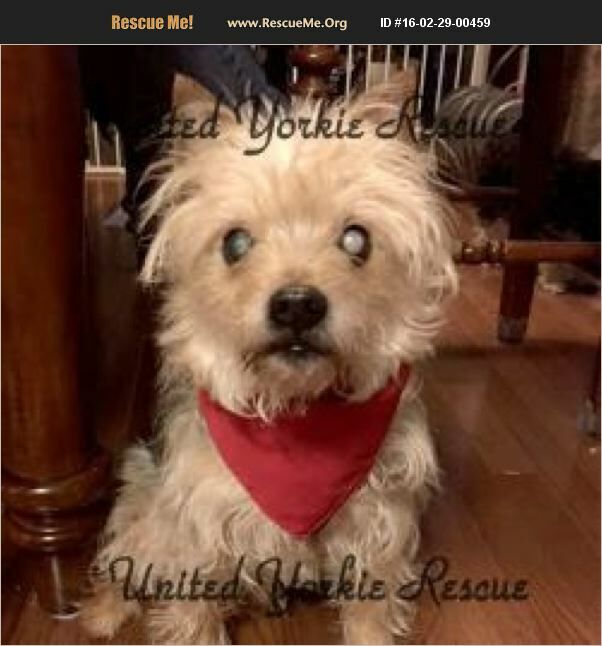 To complete an application, go to United Yorkie Rescue http://unitedyorkierescue.org.